Only a couple of more days until it's football time in Tennessee! What can we expect this year? I expect a team that is making steps forward though the overall wins and losses may not reflect that. I can see the Vols going 8-4 or 7-5 if some things break out way, we take care of business when expected and we can find an "upset" win or two. And to make sure you're fired up, let's hear Rocky Top!!!!!!! One of the chief criticisms lobbed at Doctor Who in the 80s was that it became too insular with certain stories being so stepped in what's come before that novice fans would have a difficult if not an impossible time not just figuring out what was going on in the story much less enjoying it. As someone who discovered the classic series during this particular era and saw several of the stories in question on their initial U.S. syndication run, I can say this was definitely the case in a couple of cases. And while I love what Steven Moffat is doing with the modern day series, I'm rapidly becoming concerned the series is on the verge of becoming less welcoming to new or casual fans. There's a fine line between rewarding fans for being faithful to a series and being too reliant on continuity so that you make your series frustratingly less than accessible to casual or even new fans. * The good news for those fans is that unlike back in my day of first watching, the episode are more accessible to catch-up and get up to speed. Back in the 80's I was at the mercy of whatever syndicated episodes my local PBS station ran. * I won't even bring up the question of just how Rory and Amy got from the space station at the end of "A Good Man Goes to War" to back home, trying to attract the Doctor's attention. ** Seeing all the lies taking place among everyone made me think I was watching an episode of House with his motto of "Everyone lies." Thankfully, the premise of going back in time to kill Hitler is only the focus of the story for the first fifteen or so minutes. Instead of trying to tell a story about time paradoxes or pulling a Bill and Ted, Moffat uses idea of going back in time to remove Hitler as bait for the hook and then opens the story up to being something more. Give Moffat a lot of credit--this story was packed to the gills with ideas that could have easily been their own episode, if explored a bit more. The concept of aliens who live inside a shape-changing robot and travel through time to make various criminals pay for their crimes is an intriguing one. You also had the plotline of Amy and Rory's best friend growing up turning out to be their daughter and someone who is programmed to seek out and kill the Doctor. And then we see the regeneration of Mel into River and her first ever meeting with the Doctor. And while I like how Moffat is clearly playing a long game with River and the on-going storyline, part of me is hoping he's going to find a way to wrap it up by the end of this series. At some point, the answers aren't going to be satisfying because the questions have been lingering for so long. That said, I'll be disappointed if Amy and Rory are satisfied that they knew Mel growing up and stop looking for Melody. While they know how the story ends and that their daughter turns out OK, I'm not sure emotionally that will be enough. As we see in the TARDIS, the Doctor understands there are implications to traveling with him. And while what had to happen to Donna was tragic, the idea that Amy and Rory have to give up their child's childhood and formative years to play a role in some bigger cosmic game seems far more tragic and devastating than having to wipe out Donna's memory and her dying if she ever remembers her time with the Doctor. Hopefully Amy and Rory will have some continued fall-out from this and not just go back into the "hey, let's have wacky adventures and avoid things" as we saw earlier this year. Now, I don't want it to sound like I was completely down on the episode. There was a lot to like about "Hitler." The biggest asset was the performance by Matt Smith. It's easy to see him each week as the Doctor and forget, at times, how solid the work he's doing here really is. But then Moffat steps up and gives him a tour-de-force like the Doctor dying and his body slowly shutting down. Watching physically as the Doctor's body starts to shut down was marvelous from a physical standpoint. Smith seemed to be made of the same stuff as actor Jim Carey as the Doctor faced one leg shutting down and wrestled with the poison slowly killing him. In a lot of ways, I'm conflicted about "Hitler." There were parts of it I really liked, but parts of it were frustrating. I'm really hoping that Moffat will wrap-up his current masterplan by series' end. It's not that I don't like it or haven't enjoyed it, but I really think I'm ready for the big payoff and then exploring some new, interesting avenue. Over the course of the series, Walt's Heinsenberg personality seems to come out with the most force when Walt is backed into a corner. And this week, that trend continues as Walt slowly feels like he's losing control of everything in his life and calls on Heisenberg to push back. After Skylar pushes him that this could be the time to get out and go to the police because she sees him as just a cog in the meth making machine, Walt pushes back hard. Just as he did last week at Hank's, Walt's ego won't allow him not to take credit for becoming the power player he believes he is. (I'm not sure he's there yet, but it's coming). Walt refuses to allow Skylar to see his criminal side as anything but the lynchpin to the entire empire and without him, nothing could or would happen. Walt's self-delusion is on full display here and for the first time, Skylar really gets a glimpse of the danger that she's invited back into her home. But like a moth to the flame, she is drawn to it, even if it places she and the rest of the family in harm's way. Walt continues to struggle with the perception people have of him--of his not being the boss. With Jessie getting an expanded role in the operation with Mike, the car wash guy giving him a lecture on how to be the boss and Walt being left alone to clean-up the lab after Jessie goes off with Mike, Walt may think he's the lynchpin, but the reality of things isn't lining up. I'm not sure how he thought bribing the cleaners to come clean up the lab would end in anything good. Gus apparently decides to deport them, which could be a mistake in the overall scheme of things. (Given his issues with the cartel, it's probably not a good idea to leave a loose thread like these three ladies out there). But somehow Walt is genuinely surprised that Gus isn't happy about this development. Walt figures he's got carte blanch to do whatever he wants and Gus has time and again shut that down. At some point, you'd think Walt would learn. Of course, the season continues to isolate Walt from everyone. Walt reaches out to Walt, Jr by buying him a car. And while Walt learned the lesson in celebrating last week when it came to not buying an expensive bottle of champagne, he apparently didn't have it sink it when it came to buying his son a new guy. I have a feeling the show's emphasis on Walt's lack of forethought on money matters is setting up his downfall when the series ends next year. And so Walt is now more isolated from the family and Gus is making sure that Jessie is driven away from Walt. The scene where Gus says he sees potential in Jessie was exactly the kind of assurance Jessie has craved all year. He's getting affirmation from Gus and Mike that he only gets from Walt when Walt has their backs against the wall or Walt needs something. Of course, it could all be part of the some bigger game that Gus is playing with Walt (Gilligan has said several time that season four is a chess match between Walt and Gus). If it is, Gus is playing it masterfully because even when Walt correctly realizes that the hold-up last week was all a ruse, Jessie doesn't believe it. It all leads up to the final chilling moment when Skylar comes back and tells Walt she has to protect the family from the guy who protects the family. Once you get past the initial thrill that live football is being played and broadcast, the first game of the NFL pre-season isn't really all that exciting. In fact, if you miss the first quarter of the first pre-season game, odds are you're going to see a lot of players out there that you'll never hear from again come opening day. 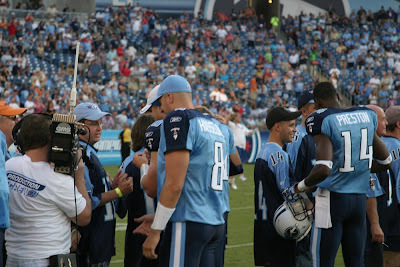 And while I can't say the first game of the pre-season for the Titans last Saturday was any different, I can say that I was pretty excited to head out to LP Field for the game. It's because I was fortunate enough to win a pretty special experience before the game. A few weeks later, the draft happened. The Titans picked Locker. I got pretty excited, but then realized that even though I had the right pick, there could be a lot of other people out there who did as well. I knew from the rules that the correct picks all went into a hat and the winner would be selected. I figured I could take pride in knowing that I'd at least got to the final round of the contest. And then, I got an e-mail...saying that I'd won. The prize pack included a chance to meet Locker and get his autograph plus four tickets to the home season opener against the Ravens. I was pretty excited about it...until I found out that the season opener was six days before a big day coming up. If the NFL pushed back the season a week, I'd probably miss the game since I'd be on my honeymoon during the Titans vs Ravens game. My bride loves but I'm not sure that love extends enough to postponing our honeymoon a day for a football game. Thankfully, the NFL worked all this out and the game will go on as scheduled. The people in charge of connecting me with my winnings contacted me to try and figure out when I'd like to go out to practice and meet and greet Jake Locker. I was eager to go, but I figured since I could take family and friends with me, it might be cool to take my nephew along with me. For one thing, he loves anything that allows him to spend time hanging out with Uncle Michael. For another, I felt that I had a chance to help him catch the football bug at an early age. Well, turns out that I wouldn't be able to take him. That's because the Titans upped the ante last week, giving me two club level seats to the game and a chance to participate in a pre-game ceremony to welcome back football. 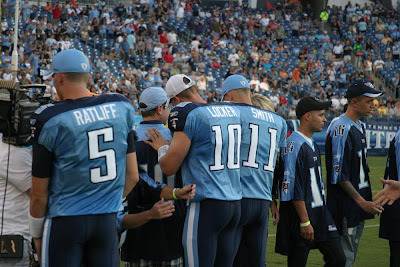 I'd get a Locker jersey, get to wear it onto the field and have Locker come over and sign the jersey before the game. So that's pretty much what happened Saturday evening. In my years of being around football both as a fan and covering it, I've been on the sidelines and field of several venues for viewing the greatest sport EVER created. But I'd never been on the sidelines or field of a pro stadium. I have to admit, even just the pre-game it was pretty inspiring. Watching the players warm up, seeing punts sail over our heads as we lined up on the 20 for the ceremony and seeing all the players up close and personal. It was a very, very cool evening. Of course, it was helped by the fact that Locker came in and had a marvelous play for a touchdown...if you've watched SportsCenter, you've seen it. All that, plus the Titans won the game. Pretty exciting. I'm not sure if the regular season game can top the experience, but I'm sure it will try. 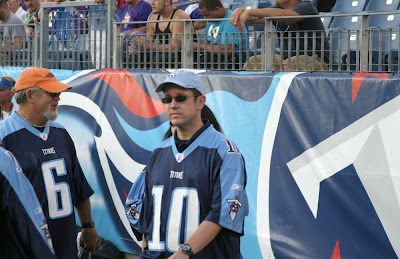 Of course, it can easily top it if the Titans beat the Ravens, a team I've learned to dislike as much as I do the Cowboys or the Gators. Frank Cagle's latest Metro Pulse column lays out why expansion has to be done right, if the SEC is going to do it. The consensus among the smartest and most influential sports writers around the South is that conference expansion is coming. And it likely will include four teams instead of two. It is unfortunate that the conversation has now shifted into a parlor game—who would you pick to join? In addition to A&M, the names mentioned are Oklahoma St., Virginia Tech, Florida State, and Georgia Tech. If Georgia Tech, a school that used to be in the SEC, and Florida State, in the region, came asking to join the league, it would probably work out. Arkansas and South Carolina joined in recent years. But this isn’t what the latest talk about expansion is about. It’s about stretching the SEC into a national powerhouse. Where does it stop? You want to start going to Arizona for games? Oregon? Twenty teams? A Super Conference outside the control of the NCAA? If you lose your regionalism, lose your cultural ties, and dilute traditional conference rivalries, you haven’t expanded your conference. You have destroyed it and morphed into something else. The best take on the Miami situation and revelations I've heard so far is that people in Miami are questioning if they were cheating as much as alleged, why were they not winning more games? Vince Gilligan proved in season two that he can be clever when it comes to episode titles. If you go back and look at the titles for each episode featuring the burned teddy bear, you'll notice a pattern. (I wish I'd seen it, but Gilligan revealed this information on the DVD extras). It's got me thinking about the episode titles for season four--and how two of the first five have centered on guns. Is Gilligan trying to tell us something? Or am I reading too much into things? Either way, it's still something to ponder. As I was watching the episode unfold, I was once again struck by the fact that no matter how smart Walt may think he is, he's still extremely stupid in a lot of ways. Walt may be a genius at producing crystal meth, but as the perceived drug kingpin he wants to be, he's still several steps behind and, at times, his own worst enemy. Once again, the episode featured people slowly chipping away at Walt's own self-image and inflated sense of importance. When he goes to the chicken place to confront Gus, Walt assumes the security cameras must be focused on him with Gus watching his every move. Same thing in the lab as Walt assumes Gus is monitoring him at all times, waiting for Walt to shout at the cameras or do something. I'm going to guess that given how Gus is, he may get a report on Walt's activities and pay someone else to watch his every move. The chipping away continues at home when Skylar assumes Walt's message left on the machine in a bit of blind panic is more than it is. Walt's emotions comes to the surface out of fear that something bad could go down since Jessie has disappeared. So it's interesting that Walt uses this to his advantage to sleep with Skylar, but then isn't necessarily ready to move back into the house. Later we see Walt, Jr. drinking coffee out of a Beneke mug, reminding Walt that he can't or won't forgive Skylar's indiscretion with Ted. It's also interesting that just as Ted wanted more than Skylar was willing to give, now Skylar wants more than Walt is willing to give. But yet, Walt is still outmaneuvered when Skylar tells Walt, Jr. he's moving back into the house. Walt is also outmaneuvered by Gus when it comes to Jessie. Walt believes he's the one thing keeping Jessie alive and in the game. But now Gus has given Jessie a greater purpose, meaning and sense of acceptance. He's also given Jessie someone else he could potentially bond with in Mike. We saw Jessie try to reach out to Walt a few weeks ago and Walt reject him because he had other places to be. Mike could be just what Jessie needs to try and get past his grief over killing Gale. After all, Mike knows the impact killing someone under orders can have. And with this, Gus makes another move to isolate Walt....could Gus be putting pieces in place to try and get rid of Walt? After all, he's got a ton of security footage of how to make the meth. And as we saw in the season premiere and were reminded here, Walt and Jessie may not be necessary much longer to the process. All of this leads to Walt trying to drown his rage in wine. And then the wine does some talking at the dinner table with Hank. Walt, no longer able to take that he isn't getting credit for Gale's notebook, brags that there could be another genius behind Gale and that Gale was simply the student. I loved the look on Skylar's face as Walt smugly says there could be Heisenberg is still out there and that Gale is nothing more than a student. Just as Hank has decided the case was closed, Walt put him back on the scent, re-ignited Hank's passion to take down Heisenberg and has, probably, set another wheel in motion toward his own self-destruction. After it was reported as all but fact Saturday night, it seems that Texas A&M won't be joining the SEC in 2012 after all. I've got to admit, I think that's a good thing. In the long run, I fully believe that the SEC will expand but that it will be for financial reasons. Bringing in more TV markets increases its ability to negotiate for a larger TV contract and it will expand the recruiting base for schools in those areas. Bringing in a school from Texas will probably happen at some point--whether or not it's A&M remains to be seen. But, I do like that the SEC seems to be willing to sit back and think through the decision and not just rush into something. As I asked Saturday, if you bring in A&M, what is the next team you bring in to even out the number. I've heard rumors of FSU, Clemson and Missouri. There was also discussion of Georgia Tech and maybe a school in Virginia. I think the SEC is wise to step back and consider who to bring in. I've heard that it doesn't want to bring in any teams already in the SEC footprint. This is why I figure the decision on who gets an invite would be a financial one and not one based on rivalry and the tradition of the league. I'd hope someone involved in this decision would bring that up at some point, but it seems less and less likely to happen. Texas A&M To The SEC?!? The buzz that Texas A&M is bolting the Big 12 for the best college football conference in the country has reached a zenith tonight with ESPN confirming it will happen and we'll hear the details Monday. Needless to say, it's a story I'm keeping my eye on for a couple of reasons. The first is it's an SEC expansion and if it happens I could see the SEC going super conference and, once again, leading the way for college athletics, especially college football. We started the the conference title game and all others followed. Now it looks like we could start the super conference movement and all others will follow. Of course, my first big question is if we expand, who are the other teams coming in? And what would this mean for realignment? And how would that impact the rivalries that have built up over the years and that are traditionally played each fall. I can't imagine an SEC football season without Tennessee vs Alabama, but I have a strange feeling this could be a casualty of realignment. Finally, I have to think that Texas A&M's desire to leave shows the failure of the Big 12 as a conference. This is twice in the past year or so we've heard of them making a move to leave...and the blame falls squarely at the feet of Texas. They're the bully on the block, bending the will of the Big 12 to their whims and pleasures. They want to be in a conference and independent...to have the best of both worlds and they don't care who or what they step on or over to do it. And the fact that the Big 12 is allowing them to bully it and the other teams in that conference just shows what happens when you don't have solid leadership like you do in the SEC. This could be an interesting week....and we don't even kick-off the games for three more weeks. Bring on the circus! This week, we once again see how differently Walter and Skylar are approaching their life of crime together. Skylar is all about planning things out, making sure no i is undotted and no t is uncrossed. Walt is much more reactionary, scheming on the fly and generally not looking at the bigger picture until he's forced to do so because of a fear for his safety or long term future. The visit to Hank and Marie's to come clean about how Walt earned all the money they have coming in highlights this. Skylar is all about having an exact script of how things will go and then following it to the letter. She's even written out how the conversation and confession will go and what she and Walt will say at each point along the way. Her plan even goes as far as having Walt try to play a hand or two of blackjack to see if he can really count cards and has a method to winning back as he says he does. The result is that Walt isn't really any good at counting cards and he probably thinks its as easy as the movie 21 made it look like it could be. On the other hand, you've got Walt who is adept at thinking on his feet and being reactionary. The last couple of episodes have shown that isn't always a good idea, as we see when he tries to recruit Mike to his side against Gus. But here, we see Walt thinking on his feet and trying to figure out just what Hank knows and suspects about the super lab. We even get to see Walt crafting a lie to cover up that Gale dedicated his notebook to Walt and that Hank wonders who W.W. could be. Walt's quick cover up that it was Walt Whitman, a poet referenced in the pages and not Walter White was fascinating--and it seems like one of those details that could come back to haunt Walt. I did love the scene with Saul where Saul points out that no where in Walt's grand scheming of how to end the game and come out ahead is Saul even considered. I also think we're slowly watching Walt fade away and Heisenberg emerge to take over. It may be a necessity to ensure Walt survives what's to come. It does feel like Walt isn't reacting well being chipped away at piece by piece this year--from Gus, from Mike and from Skylar. At some point, Heisenberg will reach a breaking point and begin to push back. Meanwhile, Jessie is spiraling more and more out of control and becoming a greater liability. Jessie's lack of caring about whether he left clues at Gale's murder scene that could link back to him or that his money was stolen are telling. Jessie seems to have given up on everything and is just going through the motions. At some point, Jessie could become such a weak link that he either turns in everyone or has to be taken out. Mike meets with Gus about this and then takes Jessie with him out into the desert. The interesting question lingering is was this Mike's idea to try and reach Jessie to save him or was it directed by Gus? And no matter whose idea it was, what is the final end game for Jessie? Is it a wake-up call to scare him back into the fold or is it to be the end of Jessie? At this point, I wouldn't put it past Vince Gilligan and company to bump off Jessie. Produced seventh but shown fourth in the original run, "The Naked Time" is an episode that works better if you have some understanding of who the characters are. It's also the clearest indication that classic Trek is really finding its storytelling footing and that most of the elements are coming together. Written by John D.F. Black, who also served as an early script editor for the show, "Time" finds the Enterprise crew dropping by Psi 2000 to pick up the research team stationed there and observe the collapse of the planetary system's star. Spock and Lt. Tormolen beam over and find the crew all dead, frozen in various position including one showering while fully clothed. The episode features one of two time we'll see environmental suits in the original run of Trek and I've got to admit they're a lot less cool that what we see in "The Tholian Web." Suffice it to say, Tormolen doesn't follow regulations and takes off a glove at one point, allowing himself to become infected by something. Beaming back to the ship, he and Spock check out OK but that's only because the scanners look for what's known. Tormolen starts showing signs of deep depression over what happened on the station and is full of self doubt. It all culminates in the rec room where Tormolen becomes suicidal and tries to kill himself with a butter knife. Sulu and Lt. Kevin Riley stop him, but in doing so they contract the disease. As the episode progresses, the infection spreads among the crew. It slowly lowers inhibitions and allows things hidden under the surface to come to the top. Sulu imagines himself a swashbuckler and spends some of the episode running about the ship, brandishing a foil. Riley takes over engineering and turns off the engines just as the ship is spiraling down toward Psi 2000. Chapel is infected and professes her deep feelings for Spock. Spock is infected and his emotions rise to the surface and Kirk is forced to face the loneliness of command. For the most part, all of the scenes with characters losing control work extremely well. In fact, they work better if you're familiar with the characters and you watch this one seventh instead of fourth in the rotation. The episode was one of the first of many battles Leonard Nimoy would wage over the character of Spock. As originally written, Spock was supposed to become emotional over a prank pulled by an unnamed infected crewmember. Nimoy argued (and rightly so) that even losing control of himself as Spock was, he'd still find a way to get out of the public eye before his breakdown. Spock's breakdown is one of the more compelling early moments for the character and the confrontation between Kirk and Spock in the briefing room is one of the best scenes in the original run of 79 episodes. I know I end up sound like a William Shatner apologist a lot here (and just wait until we get to the next episode...) but watching him chew scenery here shows you exactly why he was cast as the lead role in the series. Despite his penchant to go hammy, there are times when the guy is really effective and this is one of them. (I recall that when SciFi ran the Trek special editions back in the day, Shatner ruined this by hamming it up when he thanked everyone for the kudos about this particular scene). Produced as one of the first dozen or so episodes, "The Naked Time" still finds Trek trying to decide what to do about Janice Rand. It's clear that the show wanted them to have a lot of unresolved sexual tension along the lines of what we'd get with Riker and Troi in TNG and Kirk spends a bit of his losing control moments lamenting that he's not allowed to notice Rand and that he has "no beach to walk on." While Rand has potential as a character, it's probably for the best that NBC asked Gene Roddenberry to write her out of the show. And while I said earlier that it's better to see this one seventh in the run, watching this one followed by the next aired episode "The Enemy Within" will reveal a bit about Kirk's character and have some things actually make a bit more sense. Of course, it wouldn't be an everyone goes crazy episode without the ship in peril. And it is between a decaying orbits, a star going nova and the engines being turned off. Each of the classic Trek characters is given a bit of a moment to shine--none more than Scotty who gets to lament that you can't change the laws of physics for the first time in this episode. Of course, after the commercial break, he manages to find a way to bend them a great deal...but that's not the point here. Interestingly, Next Generation would pretty much remake this episode for their second episode. If you watch both in close succession, it's easy to see how this episode was re-written and tweaked a bit for the Next Gen crew. I'll admit that it was that episode and its preview that had me worried about Next Generation early on its run. I wondered just how many rehashes of familiar stories were on the horizon. Earlier this summer, TV critics Alan Sepinwall and Dan Feinberg discussed the preview segments they'd seen of Breaking Bad, noting how in many ways Walter White didn't get as much screen time as some of the supporting characters in the first three installments of season four. And that's OK because at this point, the series is more than just about Walt and his journey to become Scarface (though that is important, mind you). It's also about how Walt is corrupting everyone who comes into his orbit. (Thankfully, this is handled a lot better than it is on Rescue Me where everyone comes into orbit of Planet Tommy whether it seems feasible or not). It could be that Vince Gilligan and his writers are sewing seeds of a Walter White slow burn that will ignite at some point this season--probably with very, very bad consequences for all involved. While Walter has been the catalyst for all that's happened this season and since season one, we can slowly see Walt being diminished again, much as he was last year. And it's only a matter of time before Heisenberg rears his ugly head. 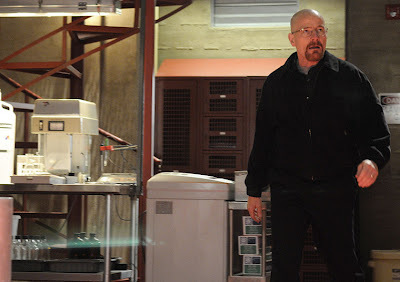 At some point, I expect the show will allow Heisenberg to stay more on the surface and we could eventually see the Walt we knew at the show's beginning vanish completely. In some ways, Skyler is better at the criminal game than Walt. Or maybe she's still so new to it that the creative juices are still flowing and it's not just part of the daily routine as it is for Walt. Her scheme to get the car wash sold is a nice touch as is her constant pressure on Walt to think through how he spends the money. Watching the scene where she calls Walt out for buying the expensive bottle of champagne (even though he used cash) and leaving a trail was nicely done. It makes me wonder if Gilligan is setting the table for how Walt will eventually fall--not due to his meth making operation but because of a careless mistake and possibly going to jail for tax evasion. Meanwhile, Marie is back to her old habits. With Hank being emotionally abusive, Marie returns to her life of kleptomania crime, visiting open houses and taking on a different identity each time. She also takes something from each house and ends up getting caught when a realtor she duped at one open house is at another. Marie's breaking down at the thought of going home and back to Hank is telling as is his growing abuse of her. The argument over whether he asked her to get Fritos or Cheatos seems like it could be a case of Hank just trying to pull her strings so he can be alone again. Or to wallow in the self pity of no longer feeling useful. By episode's end, we see Hank become frustrated by watching city council meetings on cable and instead consider the notebook taken from Gale's apartment as evidence. It's probably only a matter of time before Hank puts two and two together and figures that Heisenberg is behind this. On a random thought, I wonder if Gus is setting up Walt as a fall guy should the super lab ever come to light. Given how thorough Gus is, that could be the case. 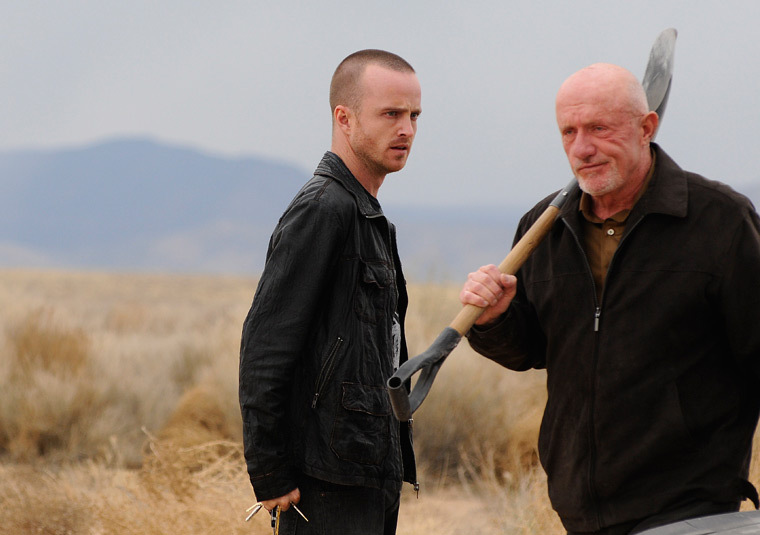 Meanwhile, Jesse continues to fall apart, even reaching out to Walt to go hang out. Given how up and down their partnership has been, this is extremely telling. I have a feeling Jesse hasn't even bottomed out yet. It's interesting to see Walt try to briefly reach out to Jesse after realizing that maybe Jesse is struggling after killing Gale. Again, it's someone coming into Walt's orbit and being corrupted by his descent into criminal mastermind. The season is heating up and getting more and more interesting with each passing week. 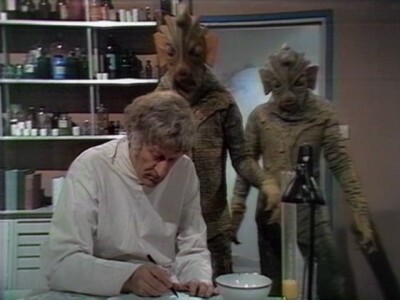 When writer Malcolm Hulke first heard that the Doctor had been exiled to Earth for the early part of the Jon Pertwee era, script editor Terrance Dicks says he thought for a moment and then replied the new series format gave the show two possible stories--mad scientists or alien invaders. And as Dicks is fond of pointing out in many of the Pertwee era extras, it didn't take long for Dicks to realize that Hulke was right. So, it's interesting that for his first contribution to the Pertwee years, Hulke would deliver a story that featured both mad scientist and alien invaders. But instead of the aliens coming from outer space, Hulke would subvert the format by casting humanity itself as the alien invaders--at least if you consider the story from the point of the view of the guys in the rubber suits. The first season featuring Jon Pertwee is arguably one of the top five seasons in the close to 50 year run of the series, featuring stories that could be labeled as more "adult" than much of what we saw before or after. And it's not "adult" in the same way that Torchwood sees adult, but adult in the themes and ideas laid out in the stories. Another term used to describe season seven is "gritty" and that view if on full diplay in "Doctor Who and the Silurians." When UNIT is called in to investigate power losses at a nuclear power station built inside a series of caves on Wenley Moore, the Brigadier calls on the services of the Doctor and Liz Shaw to assist the investigation. The Doctor quickly uncovers a conspiracy that seems to center on the caves in which the station was built. Exploring the caves, the Doctor discovers a race of reptile creatures who were once the dominant life form of planet Earth. Fearing a small planet would destroy their ability to survive on the surface, they went into suspended animation in the caves only to see the alarm clock fail and not revive them on schedule. In that time, humanity evolved and took over. Now using power from the generator and by making promises to several scientists, the Silurians (as they've called in the story) are beginning to revive. Several of them have designs on re-establishing themselves as the highest form of life on planet Earth and are pretty upset that the ape descendants are running the show now. One thinks a peace treaty can be brokered to allow both races to co-exist on the planet. The Doctor is firmly caught in the middle, trying to broker a peace and keep both sides from destroying each other due to mistrust and fear. Eventually, a younger faction of Silurians eliminate the Old Silurian who along with the Doctor is committed to peaceful co-existence. They release a deadly virus to wipe out humanity. The Doctor finds a cure and then sets the reactor into meltdown mode to trick the Silurians back into hibernation. His hope is to revive them one at a time and convince them and humanity that we can all live on the planet together. The Brigadier has other ideas, blowing up the base and sealing the Silurians in the caves forever. At seven episodes in length, it'd be easy for "Doctor Who and the Silurians" to drag or have the typical six-part treading water moments where little if anything is done to advance the plot. And while episode six suffers from a bit of water treading (we spend a long time watching the Doctor try to find a cure), it's not so much water treading as it is allowing the story time to breath and to let the implications of what is going on fully sink in. Yes, we see what seem like multiple permutations of the Doctor failing to find the cure just yet, but it's interspersed with scenes of the impact the plague is having and reinforcing why the Doctor needs to find a cure and find it soon. It's not just in that area that the story builds its tension. The story wisely keeps our view of the Silurians themselves limited for the first three episodes. We see the creatures in shadows and see things like an arm or a leg, but we don't see the full on creature until the cliffhanger for episode three. And while visually these are little more than guys in rubber suit monsters, Hulke makes them a bit more than your standard monster hell-bent on conquering the Earth. It's an interesting contrast to the previous story where the Autons were simply invading the Earth. In the case of the Silurians, the shoe's on the other foot since technically we're the invaders and they're just trying to take back what was theirs. It's interesting to see how the Silurians are willing and able to manipulate certain members of humanity to fulfill their needs. When the story begins, one of the scientists, Dr. Quinn, has been promised vast scientific secrets if he'll help them revive their race. Of course, Quinn is eventually killed for his troubles, but that's only after he ceases to be of use to the Silurians. Also of interest is the reaction of several minor characters who see the Silurians early in the story (before the big reveal). One scientist in particular who is found wandering the caves after his fellow caver is killed by the Silurians watchdog dinosaur (and yes, it's every bit as ineffective as you might think visually) triggers some kind of racial fear of the Silurians, possibly left over from the time before the reptilian creatures went underground. There's a sense early on and throughout some of the later episodes at some kind of primal fear of the Silurians on the part of humanity. But for all its strengths, there are still some weak points to the story. As has been pointed out time and again, Malcolm Hulke is a good writer but at times his cliffhangers are forced into the story. 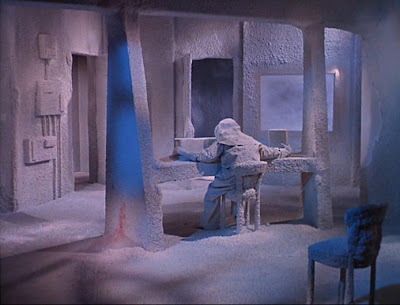 It's not quite as bad here as it is in "Frontier in Space" but there are still a few that feel forced. For example, in episode one the Doctor suddenly feels a great urge to run down into the caves, setting up his own meeting with the watchdog dinosaur. Then in episode six, the Silurians spend a long time tunneling up to come kidnap the Doctor...or at least it seems that way based on how thing are unfolding on screen. In the long run, those are minor quibbles really in what is, quite frankly, one of the better Pertwee era stories and a good example of how Doctor Who can be adult in terms of themes examined, character development and creating conflict by having both sides of the argument have some legitimate points. It's leaps and bounds better than what Russell T. Davies considers as adult in the first two seasons of Torchwood and it shows the Who universe is one that can both entertain and make you think without missing a beat.